Each summer drum corps will travel more than 10,000 miles across the country. In between racking up miles on the tour bus odometers, corps members will eat, sleep, and rehearse in between more than 30 performance stops on Drum Corps International's Summer Music Games Tour. With the help of band directors, schools and other organizations across the country who provide housing facilities for corps throughout the summer, the units of Marching Music's Major League have a place they can call home, even if only for a day or two as they prepare to enter a brand new city or state while making their next move down the road. Jim Bertucci is the band director at Clinton Prairie High School in Frankfort, Ind., several miles north of Indianapolis. His school and band department hosted the Colts and Colt Cadets the day of the DCI Indianapolis major event on July 28. Having hosted corps for five years, starting with the Glassmen where his son "aged-out" two years ago, Bertucci is a seasoned veteran at housing groups and encourages other schools across the country to do the same when drum corps come to their towns. It was a bit of a challenge to host the corps this year, as all three of Clinton Prairie's gyms – where corps members typically spread their sleeping bags and other personal items out when at a housing site – were unavailable since the floors were being refinished. Consequently, corps members unrolled their sleeping bags for the night in classrooms and other areas of the school. "Despite the spatial challenges, we were able to make it work because corps members are flexible. They're used to just about anything," said Bertucci. The Colts perform on July 28 in Indianapolis' RCA Dome. Bertucci realizes that the benefits of hosting a drum corps outside of providing sleeping space, shower facilities and rehearsal fields, are numerous for his band program. Using the tireless commitment to excellence showcased by corps members during rehearsals, he talks to his band students about following their example so that they can make the most out of their marching band rehearsals in the fall. 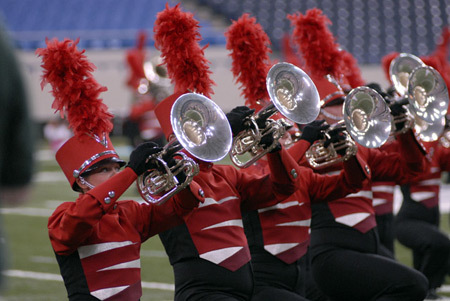 "The example set by the drum corps members is incredible. They run back to their drill spots, don't talk, watch and listen to their instructors and do whatever it takes to utilize the time they have. Observing that example, my students see that the shows the corps perform don't just happen overnight. It takes a lot of planning and effort, focus and education. The students see that all that work does pay off. My son found he could get more out of himself than he could dream about when he pushed himself in a drum corps." Bertucci leaves these words of advice on how other band directors can work to have their administration go along with hosting a drum corps: "We have a supportive administration. When we presented the idea of hosting a corps, it just took a little bit of education. Once the principal saw what it involved and how well the groups handle themselves, it was a done deal. Corps are known for leaving a school cleaner than how they found it when they arrived. "I would tell other band directors who might be able to host drum corps that it is worthwhile in several aspects. I've hosted several corps, and they have always been open about wanting people to come see how they do things. There are a lot of things directors and their students can get out of the experience."